The counties of Ireland were traditional and long standing divisions of the island of Ireland. 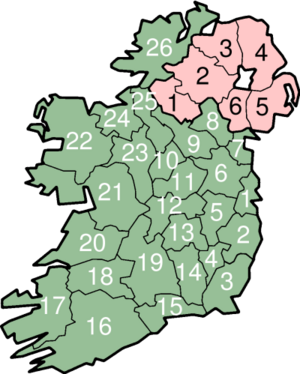 Ireland was originally divided into five provinces, Ulster, Leinster, Munster, Connacht and Meath, with the latter eventually being absorbed into Leinster. The provinces were further subdivided into many hundreds of tuatha, a term which translates from the Irish language as meaning both the people, tribe or clan of an area and the territory they controlled. Following the Norman invasion of Ireland in the 12th century, the process of shiring the country into baronies and then counties began. The counties underwent various changes and renamings over the years, settling into their by now traditional styles by the middle of the 19th century. The partition of Ireland into Northern Ireland and the Irish Free State saw the traditional thirty-two counties being split, with six of the nine Ulster counties becoming Northern Ireland, while the remaining twenty-six counties became the Irish Free State. Various changes to local government in both Northern Ireland and the Republic of Ireland have occurred over the years. County Tipperary, first established in the 13th century, was divided into two "ridings", North Tipperary (county town: Nenagh) and South Tipperary (county town: Clonmel) in 1898. The county was formally divided into two separate counties, North Tipperary and South Tipperary, in 2002. County Dublin, in 1993, was split into three new counties - Fingal in the north, Dun Laoghaire-Rathdown in the south and east, and South Dublin in the remainder - with Dublin Corporation becoming Dublin City Council, to govern the city proper. The Local Government Act, 2001 (Ireland) further refined and delineated the state's local government areas. It lists 29 counties and five cities (with equivalent status to counties), as tabulated below. In addition to the five designated cities (Dublin, Cork, Galway, Limerick and Waterford), a sixth, Kilkenny, in deference to tradition, is given permission in that Act to style itself a city, though it is not officially designated as one and has a town council rather than a city council. Until 1971, the six counties of Northern Ireland, along with the borough councils for the cities of Belfast and Derry, served as administrative areas. The Local Government (Boundaries) Act (Northern Ireland) 1971 and the Local Government Act (Northern Ireland) 1972 removed the official status of counties, replacing them with 26 Districts for local government purposes. Both north and south of the border, the traditional 32 counties are still in favour with the majority of the population. They continue to be of everyday importance in cultural and sporting contexts - for example, the Gaelic Athletic Association's championships in hurling and Gaelic football still feature teams from the 32 traditional counties rather than making use of the new counties (though there has been some limited discussion about splitting the Dublin teams in two, due to a perceived population advantage). In the Republic of Ireland, this is partly due to a lack of publicity surrounding the new counties, and partly as not all administrative systems have yet adapted to the changes. For example, the County Council of Fingal lists its postal address as "County Hall, Swords, Fingal, Co. Dublin." Similarly, although car vehicle registration plates are supposed to carry designated initials depending on the county of registration, all vehicles registered within the new counties created from the former County Dublin still all bear the initial "D", for Dublin. ↑ Local Government (Ireland) Act, 1898. ↑ Local Government (Dublin) Act, 1993. ↑ Fingal County Council website. Available: www.fingalcoco.ie Retrieved: 24th August, 2007. This page was last modified 02:10, 20 February 2010.